If you are just tuning in to Deeds' story, please read this post, first. The Monster House has a new addition, with permission. And we are SO EXCITED! It appears, y'all, that Deeds is a close relative of Animal from The Muppets. I have this on good authority. His mother tells me that he even possessed, at one time, little pajamas with Animal all over them. I KNEW there was a reason I felt such a connection to Deeds and his family! Deeds' mother, however, is not a monster. This woman is an angel.... but not just your run of the mill, halo wearing, wing fluffing, white robe sporting angel. This angel is FIERCE! I had the opportunity to talk with her this last Saturday. I was able to say "HI!!" before the tears started flowing, but that was okay, since she cried a little too. And I knew that I would pretty much be a mess during this call long before the phone ever rang. What I wasn't expecting, however, was the strength that she would give me, and the inspiration she would be to me, just by speaking to her. I remain touched by that call, and think of all the things we spoke about. She told me about Deeds' Burn Clinic appointment last Friday. She told me how Deeds asked her to kiss the compression bandage on his hand, and how through that she knew he was feeling better and being more of his "old self". She giggled when she told me little things about how he was being quirky again. And I was touched. Later that day, Deeds' mom tweeted the most awesome. thing. EVER! 4 Paws for Ability gave them their TRAINING DATE!! Wahoo!! So, now we know what the time frame is, and we know that we need to spread the word about Deeds, his dog, and his fundraiser even further and wider than it has already gone. We have already had one twitter party which was very successful, and there may be another one, but that has not yet been decided. Now, more than ever, this family needs our help. Every parent of a special needs child knows that the out of pocket costs are astronomical. Add a visit to the ER, and then an overnight stay at the Burn Unit. Add the fact that this family still needs $3600 toward their goal of $5000 for Deeds' specially trained dog that is so crucial for his safety. We are powerful, as bloggers. We have the capability of reaching across the world with one little click. We have the power to make major corporations sit up and take notice. It's been done before, and it will be done again. But think about it, for a minute. If the blogging community has the power to make a huge corporation, or major television network, or celebrity, or political leader sit up and take notice, just think how effortless it will be for us to get Deeds what he needs! But let's not make that our goal. Let's get him as much as we possibly can, as fast as we possibly can. This Momma thinks that Deeds' Momma and Daddy have spent enough time worrying. Their stress levels have been at an all time high for far too long. And now, it's our time to shine. 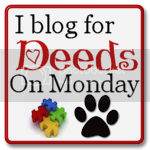 Hop on over to The Mom Adventures to get a nifty button just like the one at the top of this post, and commit to blogging for Deeds every Monday by linking your posts to HER post. Know what *I* want to see happen? I want that fundraising thermometer over on Deeds' site to EXPLODE. Not just reach the top. I wanna hear the "pop" of that thermometer all over the blogosphere. And so, we must practice that most hated phrase from Bob the Builder...."Can we do it? YES. WE. CAN!" And, really.... we CAN. All photos copyrighted by Bobbie Mauss and used with permission.